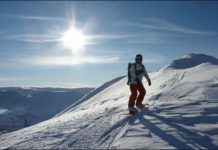 Knowing how a ski helmet functions, and what to look for when purchasing one can be helpful in staying safe on the slopes. 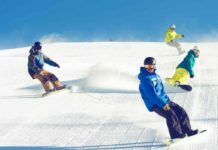 Helmets specifically designed for skiing and snowboarding can help reduce head injuries associated with these sports. 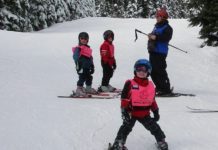 Once rare, it is increasingly common to see helmets on the slopes. 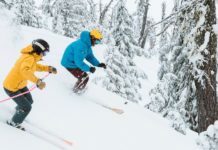 When skiing on hardpack, in the trees, in rocky terrain, or in the backcountry, helmets have proven to be lifesavers, and the use of one is strongly advocated. 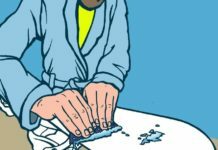 What Does a Ski Helmet Do? A ski helmet is designed to protect the head of a skier or snowboarder in the event of a fall or collision with another rider or object. It is designed with a foam interior covered in plastic. The foam absorbs the force of an impact. The plastic shell can also absorb some of the shock, and it protects the head from scraping against ice or other obstacles. Helmets are made to keep the head warm, and are designed to insulate the head. The helmet should fit snugly, but not feel constricting. Nor should it feel loose. The chin strap should fit snugly under the chin. The user should be able to hear others clearly when wearing it. Will a Helmet Provide Complete Protection? The National Ski Areas Association says a helmet can provide protection when traveling 14 mph or less down the mountain. Most riders travel well above that at speeds of 25-40 mph, and a helmet is of limited use in a high speed crash with fixed objects. Users should not be lulled into a false sense of security just because they are wearing helmets. The Association urges visitors, “to wear a helmet – but to ski or ride as if they are not wearing a helmet.” This means staying in control, following resort rules, using good judgment, and skiing safely. Wearing a helmet is one part of an overall strategy in staying safe when on the slopes. A full shell helmet covers the whole head, while a short shell offers less coverage but is also less bulky. Competition helmets are appropriate for those who plan to race or travel at very high speeds. These ski- or snowboard-specific helmets are tested for multiple impacts, extreme conditions (especially temperature and moisture) and velocity forces at multiple points of impact. 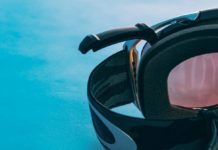 The future will undoubtedly be a multiple-use helmet appropriate for skiing and snowboarding, rock climbing, cycling, surfing, and more, but, at present, it is best to stick to a sport-specific helmet in most situations. A good fit is essential when purchasing a ski or snowboard helmet. If the helmet does not fit properly, it may not provide the protection advertised. When buying online, be sure to look at the return policy in case the helmet does not fit and needs to be exchanged. Once the skier or snowboarder finds a good fit, the helmet can be fine-tuned with padding systems that come standard with most helmets. Not all skulls have the same shape, and so there is a certain amount of subjectivity in sizing a helmet. The properly sized helmet should have a snug fit and not move about when moving one’s head. The helmet should not touch the back of the skier’s or snowboarder’s neck. It is a good idea to have one’s ski goggles on hand when trying on helmets to make sure they are compatible. Not all ski helmets are built the same. Some, for example, have more ventilation options than others, and the amount of insulation can vary widely. In some cases, the serious skier or snowboarder will want a different helmet for different situations or seasons. In-helmet sound systems have become popular as of late. 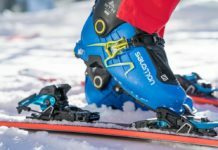 Most helmets can have an audio system added after purchase, but an increasing number of skiers and boarders are taking sound systems into account before making a purchase. Wireless systems are generally preferred over wired ones. 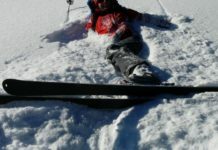 In some cases, listening to music while skiing or snowboarding can be dangerous to oneself and others on the the slopes. Ski and snowboard helmets are more fashionable than ever before. A plethora of colors and styles are available, and most people will find a helmet that matches their aesthetic tastes. It is not a good idea to paint or otherwise alter a helmet’s looks, as this can have an impact on the structural integrity of the helmet itself. Stickers, on the other hand, can be a good way to individualize a helmet.